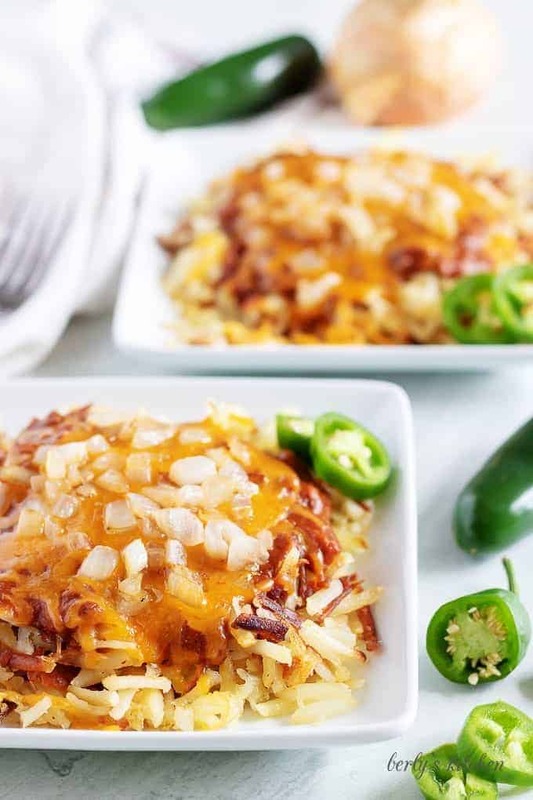 Take your breakfast to the next level with our loaded shredded hash browns. A warm and cheesy comfort food that will keep you full all morning long! Anybody in the mood for breakfast? I know I am. Of course, there are times when you want to change things up and eat something more hearty than a bowl of cereal. 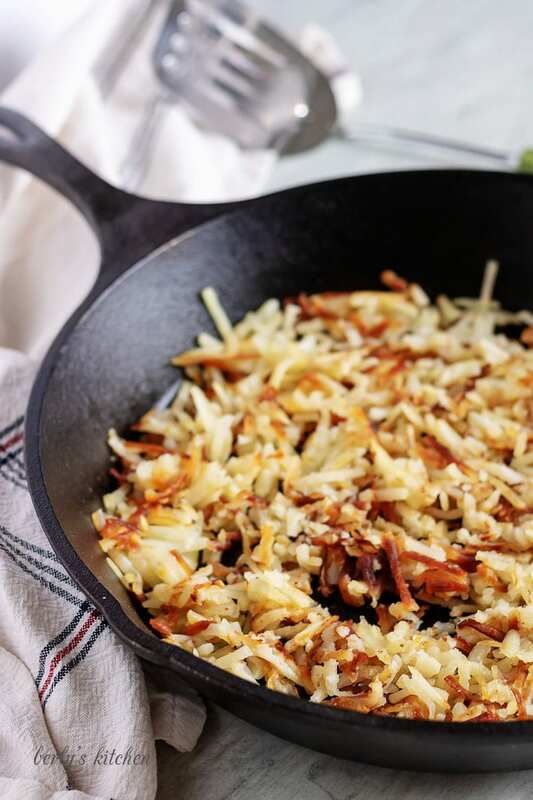 On days like that, nothing hits the spot like a plate of shredded hash browns. But why settle for the same old song and dance when you can make loaded hash browns? That was the same question we asked ourselves when we decided share this breakfast offering. 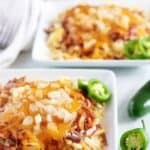 The name says it all, loaded shredded hash browns. The potatoes are traditional hash browns, shredded and cooked in butter. Butter not only tastes great but also creates a better crust. Combine that with cheese, onions, and chili and you won’t need anything else for breakfast. When I eat something like this, it means I intend on doing some hard work that day. So much, that I won’t have time for a lunch break and need something to take me through the afternoon. Believe me when I say this, our loaded shredded hash browns will do the job. If, however, you’re really hungry then consider paring this dish with our Pineapple Coconut smoothie or our Pumpkin Pie cinnamon rolls. You’ll be full for most of the day. But enough yammering, let’s get cooking! By now you should know the drill. First we prep, then we cook. So, go ahead and gather your ingredients. Then open the chili and dice your onions. Also, if needed, shred your cheese and measure out your butter. Now that we have everything prepped, grab a skillet and two (2) tablespoons of the butter. Melt the butter, in the pan, over medium heat. As it melts, spread the butter out evenly by tilting the pan. Next, add your hash browns and top them with two (2) more tablespoons of butter. Cut the pieces of butter into cubes so you can sprinkle them evenly over the potatoes. You’ll notice the butter on top start to melt from the steam. That’s okay, it’s going to sink down into the potatoes, adding flavor. At this point, I usually add pinches of salt and pepper to my hash browns, but that’s up to you. After awhile the edges of the browns will begin to darken. Use your spatula to lift the edges and check on the bottom. I prefer them to be golden brown before I begin flipping the potatoes. 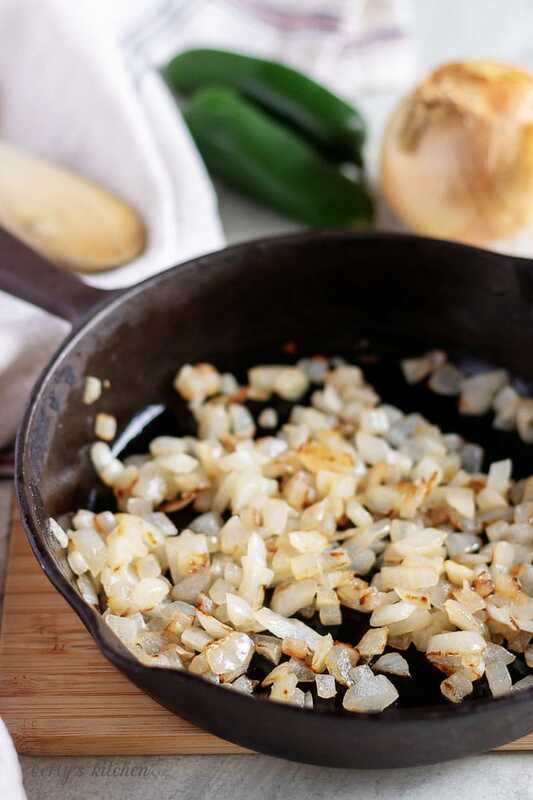 If you feel confident in your abilities to multi-task, then you can use the remaining half (1/2) of tablespoon of butter to saute your onions in a separate pan. If not, that’s okay, wait until the shredded hash browns are completely done (and removed from the heat) before you cook the onions. Once both sides of the hash browns have formed a nice crust and you’ve saute’d your onions in butter, it’s time to heat the chili. For the chili, we chose bean-less, but that’s up to you. Use a saucepan over medium-high heat or your microwave (in a microwave safe dish) to bring your chili to temperature. Personally, I bring canned goods to a boil, just to be safe. All that’s left to do is to assemble the loaded shredded hash browns. We have instructions on how to do that and they are posted below in the recipe card. With that being said, do them how ever you wish. As you can see from the pictures, we put the cheese and onions on last. Personally, I would have put the chili over the cheese, so it would stay hot and melted. But, we try to make our food look as visually appealing as possible when taking the pictures. Furthermore, Kim and I want you to see the ingredients we used. Especially, when it comes to toppings like cheese and onions. You may also notice the jalapenos being used as a garnish. Not only are they tasty, but the pepper adds a little color to offset the earthy tones. In closing, Kim and I hope you enjoy this breakfast dish as much as we do. As you’ve probably already gathered, it’s inspired by a restaurant that’s known for being open 24-hours a day and serving all kinds of diner favorites. When you eat this dish, I hope it reminds you of grabbing a late night meal with someone you love. That’s what it reminds me of, countless nights of staying up late with Kim chatting. Hunger hits, and we head off to the only eatery in town open at 2 am. If that doesn’t put a smile on your face, I don’t know what else would. The great thing about this recipe is that it can be personalized in so many ways. For example, I don’t like chili on my shredded hash browns. Therefore, I skip it and instead go for a mixture of cheese and onions. Whereas, my son likes onions and ketchup. Sometimes, we even add sausage or bacon gravy. It just depends on the day. The point is, you can use this recipe as a base for your own awesome creations. I’ve seen some people ask, “Should I thaw frozen hash browns before cooking?” The answer is no, frozen hash browns are a processed product meant to be started while frozen. In fact, most of the hash brown brands recommend starting with frozen shredded hash browns. I suspect this has to do with the solution(s) used to preserve the potatoes. If you’ve ever thawed them in your fridge, you’ve seen the potatoes become mushy and starchy. Which might be great for casseroles, to soak up all that liquid, but not so good for making a crispy side dish. 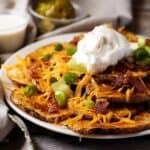 Another question I’ve read asks, “How do you make hash browns stick together?” The best method I’ve found uses the following steps. Heat a pan over medium heat with some butter. Once the butter has melted, cook the taters in small batches (the size should perfectly fit the size of your spatula), and add a little more butter on top. Most importantly, let the hash browns cook until the bottom has formed a crust. That crust, is what will keep them together. Flip the hash browns and let the other side cook until it has a nice crust. Usually, by the time both sides have browned, the insides are cooked as well. There you have it, a perfectly portioned, serving of hash browns that don’t fall apart. Looking for more tasty breakfast ideas? Then check out these offerings! 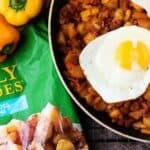 If you like this Loaded Shredded Hash Browns recipe, please leave us a comment and rate the recipe card. You can also find us on Facebook, Pinterest, Twitter and Instagram searching for Berly’s Kitchen! Heat a large skillet over medium heat. Once it gets hot, add 2 tablespoons of butter. Allow the butter to melt, and tilt the pan to distribute evenly. Place the hash browns in the hot pan in an even layer. Cube two of the remaining tablespoons of butter and dot it randomly on top of the hash browns, add salt and pepper to taste. Don’t stir or flip them for several minutes. They need time to form a crispy, brown layer. After approximately 7-8 minutes, use a spatula to lift the edge of the hash browns. If the hash browns are brown, use the spatula to flip them over in sections and cook the other side. If they aren’t browned yet, allow them to continue to cook for a few more minutes. In the meantime, begin grilling the onions. Heat a small pan over low-medium heat. Once the pan is hot, add the last ½ tablespoon of butter and the diced onions. Use a wooden spoon to stir the onions every couple of minutes. The onions will begin to soften and become translucent. Remove from heat just as they begin to caramelize. Check to see if the bottom side of the hash browns are crispy. If so, remove from heat. If not, allow them to cook for a few more minutes. 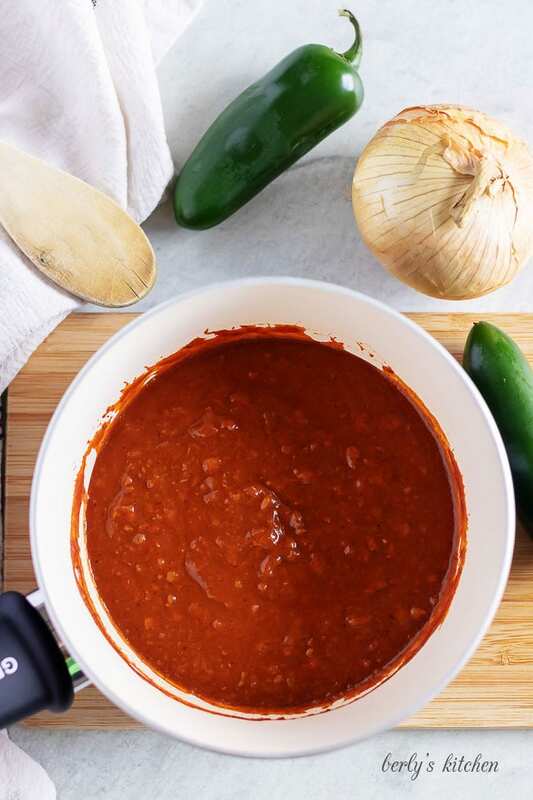 Heat the chili in a microwave-safe bowl on half power until the desired temperature is reached, or in a small pan on the stove top over low-medium heat. To assemble the hash browns, place ¼ of the cooked hash browns on a plate. Top with 2.625 ounces of warm chili. Add ½ ounce of shredded cheese to the top of the chili, then add 1-2 tablespoons of grilled onions. 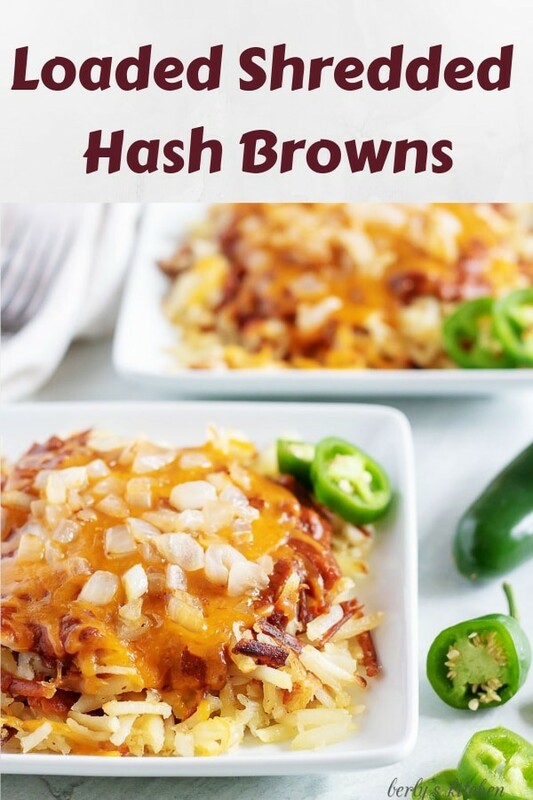 The calories listed are an approximation based on the ingredients and a serving size of 1/4 of the final product (4 ounces of hash browns, 1/4 cup onions, 2.625 ounces of chili, and 1/2 ounce of cheese per serving). Actual calories will vary. 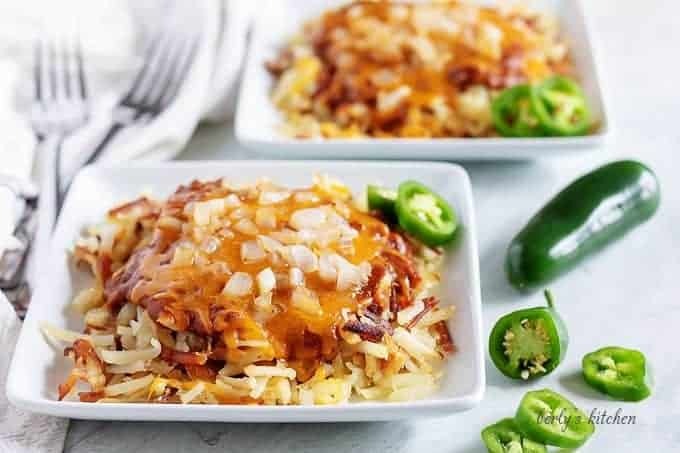 The shredded hash browns can be garnished with sliced jalapenos. I would not recommend storing any leftovers, as the fat and grease from the meal will make the hash browns soggy while setting in your fridge.